According to a Department of Justice press release, the three (Cody J. Cyson, Thomas L. Brown and Hanna F. Ponder) entered their pleas at the Yellowstone Justice Center in Mammoth, Wyoming. The trio spent a week in jail leading up to their detention hearing. Last week, we reported a pair of protesters (Brown and Cyson) had chained themselves to the squeeze chute at Stephens Creek, where biologists take blood samples of bison in preparation for their shipment to slaughter. The pair were arrested on the scene. Ponder was arrested later when she was seen running from the facility. The trio belong to Wild Bison Defense, a bison advocacy group that seeks to highlight living conditions for bison in Yellowstone and protest their treatment. Brown previously volunteered with another bison advocacy group, Buffalo Field Campaign, which issued a statement of solidarity with Brown and Wild Bison Defense. According to the release, all three received a sentence of six days in jail with credit for time served. Cyson and Brown were charged a $250 fine for “entering a closed area” and an additional $250 fine for “interference with an agency function.” Ponder was fined $500 for entering the facility through the Reese Creek drainage. All three were also charged a $500 community service payment; Brown and Cyson were charged an additional $50 in special assessment while Ponder was charged $40. All three are banned from Yellowstone National Park for five years, with five years of unsupervised probation. This is the latest incident around Stephens Creek, where Yellowstone bison are corralled and tested for brucellosis before being shipped to slaughter or held back for quarantine. 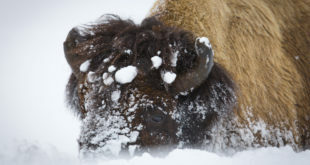 Groups like Wild Buffalo Defense and Buffalo Field Campaign protest not only slaughter but also quarantine, which they view as an attempt to domesticate wild bison. Indeed, this is the third major incident involving the facility this year. In January, someone cut fences at Stephens Creek, releasing 52 bison that were being kept there. In February, fences were cut again, with over 70 bison escaping, though most returned before crews patched things up. The National Park Service has started criminal investigations into both fence cuttings. In addition, Yellowstone has announced it would increase security around Stephens Creek, but has not said what that would look like. As of writing, over 550 Yellowstone have been killed by hunters or shipped to slaughter this year. Under this year’s Interagency Bison Management Plan, partner agencies hoped to cull 600 to 900 bison from the herd. Currently, they are well on track toward that goal.